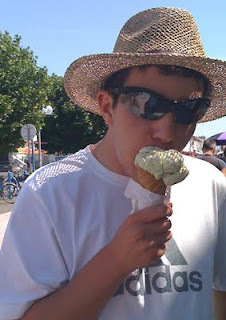 Today I have 3 ice cream pictures to share with you. Why these 3? Well, whilst they were all taken on different days and in entirely different places, they do have something rather special in common - they reflect the passion that the male species has for ice cream! From toddlers to teenagers to businessmen, the male species has a fondness for ice cream that appears to know no bounds. 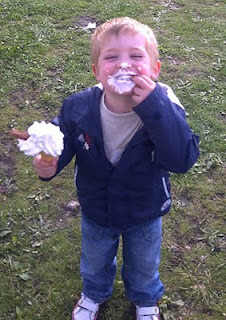 Little 2 year-old Dylan not only loves his ice cream cone with chocolate flake so much that he gets it everywhere in his haste to devour it but he positively enjoys making a mess and getting lots of attention in doing so. Wonderful! 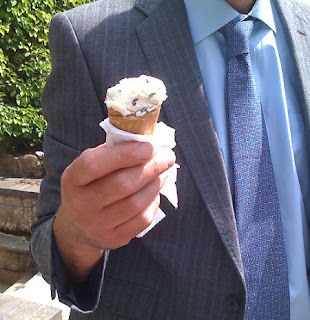 When it gets to the level of a businessman, however, it becomes a little more tricky .... how to enjoy a treat of an ice cream cone without getting it all over the suit, shirt and tie. Paper napkins at the ready chaps! If you believe the old saying that the way to a man's heart is his stomach, then be sure to have some good homemade ice cream on the menu!